Back in March, I warned that Colorado was on the verge of cutting teacher retirement benefits. Last week, legislators did just that, through a deal that's now waiting the signature of Democratic Governor John Hickenlooper. There are a couple pieces to like in the final bill. The state will be making extra, annual investments of $225 million directly into the pension fund, which will help pay down its $32 billion in unfunded liabilities. The legislation will also extend a generous, portable retirement plan called PERA-DC as an option to almost all state and local government employees. To everyone except teachers, that is. As I wrote back in March, this defined contribution plan would have been better for the vast majority of Colorado teachers. But no. The state’s teachers unions fought to preserve the existing defined benefit pension system and adamantly opposed giving teachers a choice over their retirement. The final bill will raise contribution rates and lower cost-of-living adjustments for current teachers, and teachers hired after 2020 will get an even worse pension plan. This is not a new trend. Colorado has been raising contribution rates and cutting teacher retirement benefits since 2005. By 2020, they will essentially have six tiers of benefits based on when the employee started their service. Five of those tiers were created since 2005, and each tier is worse than the one that came before it. To show what this looks like, consider the graph below. It shows how a teacher’s pension value increases over time, net of their own contributions, depending on when they begin their employment. For simplicity’s sake, I’ve condensed the benefit tiers into three different time periods. 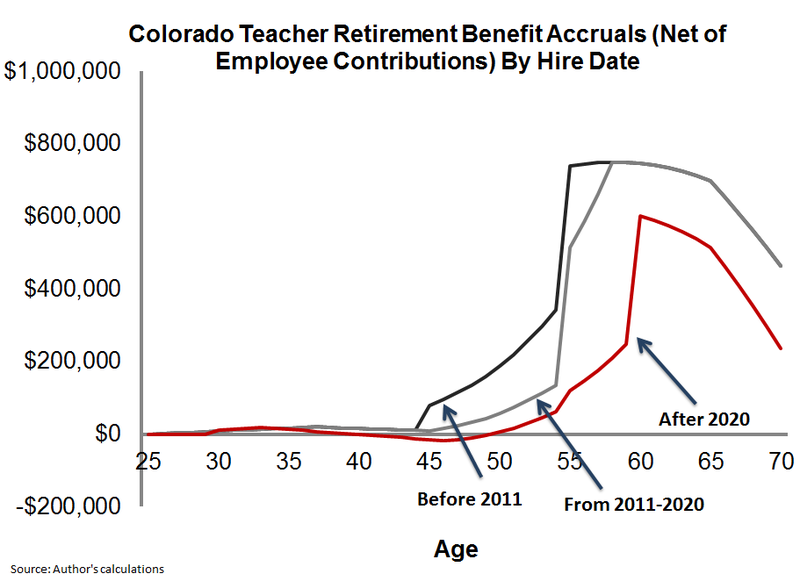 For workers who began teaching in Colorado prior to 2011, their net pension benefit looks like the black line. It was not a great plan even then, and a 25-year-old beginning teacher would have had to serve for at least 20 years before qualifying for a pension worth more than her own contributions. Needless to say, most Colorado teachers don’t make it that far. Even that cut has not been enough. The state’s unfunded liability has continued to grow, despite a record run in the stock market, so this year legislators went back to the bargaining table to address the teacher pension problem again. And once again, they cut benefits for new workers. The red line shows what retirement benefits will look like for all teachers hired after 2020. They will be forced to pay higher contributions for less generous benefits, making their net pension value even worse. The same 25-year-old teacher must stay for 26 years before her pension is finally worth more than her own contributions plus interest. Needless to say, even fewer Colorado teachers in the future will make it that far. Colorado is also one of the 15 states that does not enroll its teachers in Social Security. Teachers have nothing else to fall back on, and yet the state has created a plan that purposefully limits adequate retirement benefits to only a small fraction of people who remain teaching in Colorado for their entire career. That shouldn’t even be legal. Now, all other state employees in Colorado except teachers will have the option to join the portable PERA-DC plan. It's a good plan. Employees who choose it will contribute 8 percent of their salary, and employers will chip in another 10 percent. It’s run by the state, which ensures members have good investment options with low fees. Based on my estimates, more than 90 percent of Colorado teachers would be better off in the PERA-DC plan. To be clear, this trend is playing out across the country. In state after state, teachers are being asked to pay more money for the same or worse benefits. Rather that fighting to preserve an expensive, unfair status quo, teachers should demand retirement plans worth fighting for.